OK, hazardous environments. Fear of drowning and disease. The Kickstarter page also mentions "snake bites, fatigue, hypothermia, open wounds, and infection" as other possible causes of death... which is permanent, mind you. I like the sound of this. 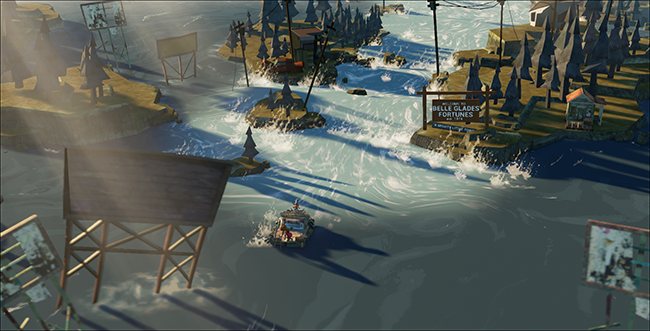 My only hope here is that by being a small indie studio with "total creative freedom" (as Game Informer emphasises at several points when discussing the shift from working in AAA games to leaning heavily on crowdfunding) means that The Flame in the Flood can really embrace its whackier, more ambitious ideas rather than just ending up as a pretty-looking alternative to, say, Metal Gear Solid 3: Snake Eater. Or the next Fallout, only with a rafting mechanic. Which is also a game I would totally love to play at some point, now that I think about it. I didn't invent the word snazzy but I was definitely there when it happened. All these ex-Bioshock devs are taking kickstarter by storm. Much more interesting to me than that trippy theatre one.